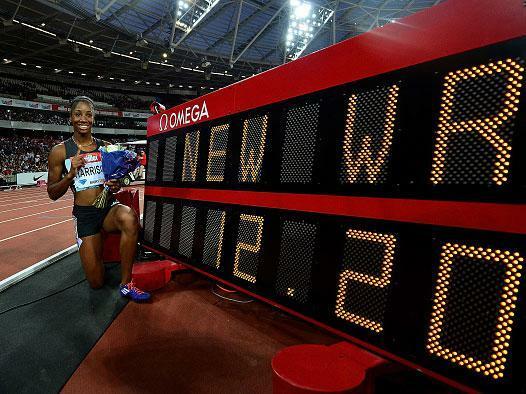 USA’s Kendra Harrison’s time of 12.20 in the 100m hurdles broke a world record that had stood since 1982. It is not often that Usain Bolt is upstaged but on a balmy night in London the fastest man in the world played second fiddle to Laura Muir, a veterinary science student from the University of Glasgow, and Kendra Harrison, a God-fearing hurdler from Tennessee. The 23-year-old Harrison produced the performance of the evening, obliterating a world-class field and the Bulgarian Yordanka Donkova’s 100m hurdles world record which had stood for 28 years. As she crossed the line, far clear of the field, the stadium clock said 12.57sec. To the human eye it appeared much quicker and it was sharply rounded down to 12.20sec – one hundredth of a second faster than Donkova. Incredibly, Harrison will not be at the Rio Olympics having finished sixth in the US trials this month, with only the top three qualifying. Muir was almost as impressive, blasting away from the field on the last lap to finish in 3:57.49, to dip under Kelly Holmes’s British 1500m record by 0.41sec. The way she pulled away from the Dutchwoman Sifan Hassan suggested something else too: she is a contender for an Olympic medal. “Breaking the British record blows my mind a bit,” said Muir. “I haven’t run a fast 1500m this year so I wanted to go out there and show the world what I can do. And it’s not just any record. It’s Kelly Holmes’s Olympic gold medal record. After Harrison and Muir, it was time for the star attraction of the night: Bolt. As the Jamaican’s name was announced, thousands of camera bulbs flashed across the stadium. An electric roar went out, but soon Bolt provided an even greater current. The Jamaican made an impressive start and was ahead at the bend, before slowing down to win in 19.89sec. Alonso Edward was second in 20.04 with Britain’s Adam Gemili third in a season’s best 20.07. This was Bolt’s first 200m of the season after suffering a grade one hamstring tear in the Jamaican trials three weeks ago and he looked a little leggy in the last 50m. But with three weeks to go before the 100m final he has plenty of time to sharpen up. It was a night for fast times for the temperatures remained stubbornly above 20C, even as the skies over London darkened, and the wind sat still. Crucially, the athletes were given further assistance by a newly laid track that its makers, Mondo, have prepared for the Rio Olympics. They insist it is the fastest ever. On Friday night’s evidence, their hype appears justified. Just how quick was advertised in the first event, as the British women’s 4x100m relay team of Asha Philip, Desiree Henry, Dina Asher-Smith and Daryll Neita set a national record in storming to victory in 41.81sec, with Brazil a long way back in second in 42.59. Jessica Ennis-Hill then showed that she is getting back to her very best as she qualified for the women’s 100m hurdles final in 12.76, her second quickest time ever behind the 12.54 she ran when winning Olympic gold at London 2012. She was less impressive in the final, clipping a hurdle hard as she finished in 13.04 but this will still count as a good night’s work. Ennis-Hill’s heptathlon rival, Katarina Johnson-Thompson, also showed that her form was improving nicely as she cleared an outdoor personal best of 1.95m in the high jump to finish third behind Ruth Beitia from Spain. However, Britain’s Christine Ohuruogu still appears to have some work to do before Rio as she finished fifth in the women’s 400m in a modest 51.05, behind Shaunae Miller who set the best time in the world this year, 49.55.